There are currently 89 people online. 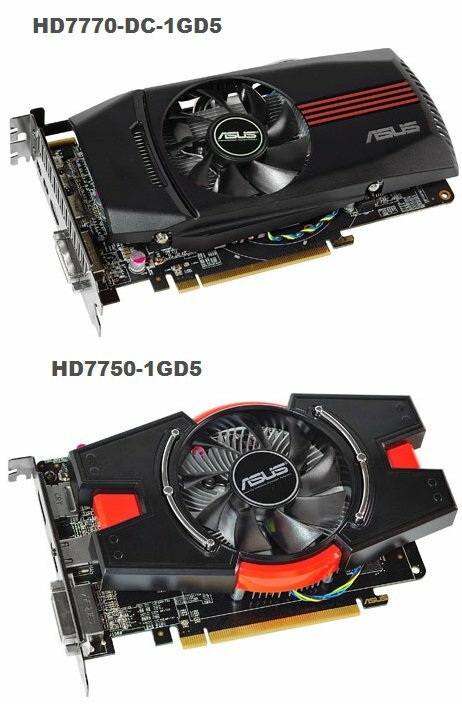 ASUS shows off its new Radeon HD 7700 cards. The HD7770-DCT-1GD5 offers a 1120MHz core and 4600MHz memory, while the HD7750-1GD5 has a 820MHz core and 4600MHz memory. The ASUS HD 7770 DirectCU TOP and HD 7750 bring 28nm GPU advancements to a very cost effective segment that combines great gaming and overclocking performance with the value sought by general home computing consumers. Both arrive factory-overclocked, and use PCI Express 3.0 as well as 1GB of GDDR5. The HD 7770 DirectCU TOP ships boosted to 1120MHz and runs 20% cooler than reference for improved stability, longevity, and overclocking. The two cards are bundled with ASUS GPU Tweak to make tuning easier and deeper than before. Thanks to the availability of 28nm production technology, new HD 7700 cards pack greater performance into a more energy efficient, quieter, and overall more compact platform. The ASUS HD 7770 DirectCU TOP runs at a factory-overclock of 1120MHz, a significant 120MHz over reference. The HD 7750 operates at 820MHz core clock, 20MHz faster than its reference design. Both use a 128-bit memory interface and 1GB of GDDR5 video RAM to enable high resolution gaming, multimedia, and productivity, with full DirectX® 11.1 compatibility for the latest PC graphics developments. With ASUS quality and assurance, the cards present a reinforced 28nm product lineup consumers can tap when looking for parts that are highly capable and at the same time very cost effective. The HD 7770 arrives in a special DirectCU TOP edition, giving it an ASUS-designed thermal architecture that relies on all-copper heatpipes in direct contact with the GPU. It also uses a more heat-conductive shroud, and a better-performing, quieter fan. Proven on multiple ASUS graphics cards in the past, DirectCU consistently outperforms reference and competing coolers in terms of heat mitigation and removal. It operates at 20% lower temperatures than reference on average while being quieter than stock, contributing to a longer lasting product that can handle more intense applications and overclocking. For the HD 7750, ASUS has implemented a double-sealed dust-resistant fan design to repel debris and minimize the harm caused by particle accumulation. This feature aids in prolonging card life cycle, makes maintenance easier, and promotes reduced fan spin to lower sound levels. Bundled with HD 7700 cards, the ASUS GPU Tweak utility has been redesigned and improved to make graphics card tuning and overclocking easier and more accessible. Users can quickly adjust clock speeds, voltages, and fan settings with greater accuracy and range than those offered by reference drivers. GPU Tweak now has auto clock and voltage syncing to ensure more stable and safer overclocked performance, as well as convenient 2D/3D mode locking to keep benchmark scores more true to form. An onscreen widget allows for fast card tracking at any time, while live BIOS version and driver updates make certain cards remain fully updated and at peak performance. Having debuted on the HD 7000 Series, PCI Express 3.0 represents a major step forward in data interfacing, as it doubles the bandwidth of PCI Express 2.0, allowing new graphics cards a better foundation upon which to utilize their greater power. PCI Express 3.0 maintains full backward compatibility with all PCI Express 2.0 devices, and the slot uses the same physical dimensions to guarantee an easy fit with existing parts. Thanks to the augmented power of 28nm technology, HD 7700 cards offer users the added attraction of AMD EyefinityTM displays to allow for much bigger resolutions and more impressive views that are well-suited to graphics professionals, designers, and artists.